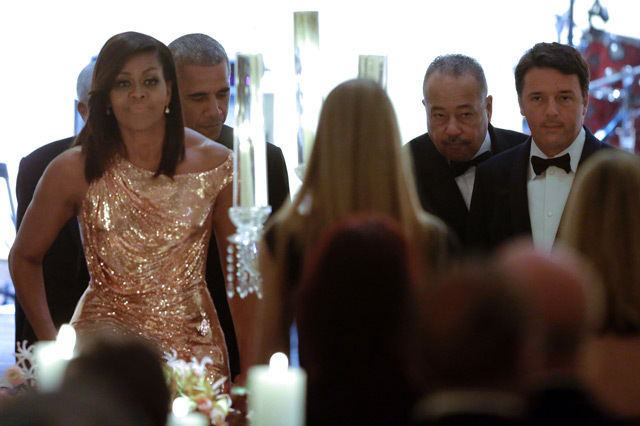 “Bittersweet” was the word of the night, the one often used to describe President Barack Obama’s final State Dinner. 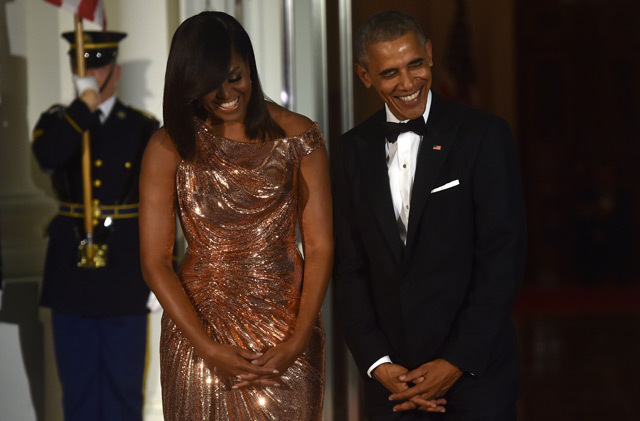 Michelle Obama’s hairstylist, Johnny Wright, also described the moment as “bittersweet,” but he was still excited to have been invited. The first lady also invited her makeup artist, Carl Ray; her trainer, Cornell McClellan; and Meredith Koop, who helps Mrs. Obama with her wardrobe. After tripping while climbing stairs and then cutting out the lining of her dress, celebrity chef Rachael Ray joked that “I should only come here in sneakers.” Ray has done numerous events with Mrs. Obama to support the first lady’s “Let’s Move” anti-childhood obesity initiative. Obama has had one dinner bigger than Tuesday’s — a 2014 event for African heads of state to which more than 400 people were invited. Tuesday’s guest list included a touch of everything: celebrities, lawmakers, senior administration officials, White House staff, a larger-than-usual contingent of journalists and others, and it had the feeling of having been designed as one big final “thank you” to all. 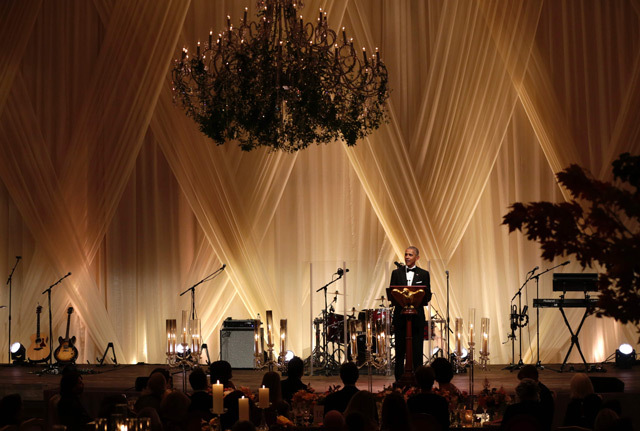 “This has truly been a successful final State Dinner,” she said between dinner and the entertainment. Batali helped the White House kitchen crew prepare the meal, and Grammy-winning pop singer Gwen Stefani opened the after-dinner segment with her hit, “The Sweet Escape,” as her boyfriend, country superstar Blake Shelton, looked on from the audience. After that song, she talked about her dad being Italian American and said “I’m trying to, like, figure this out, how I got here,” referring to the dinner. A few guests, including fellow cook Sandra Lee, Cuomo’s partner, said they were mostly looking forward to eating Batali’s food. 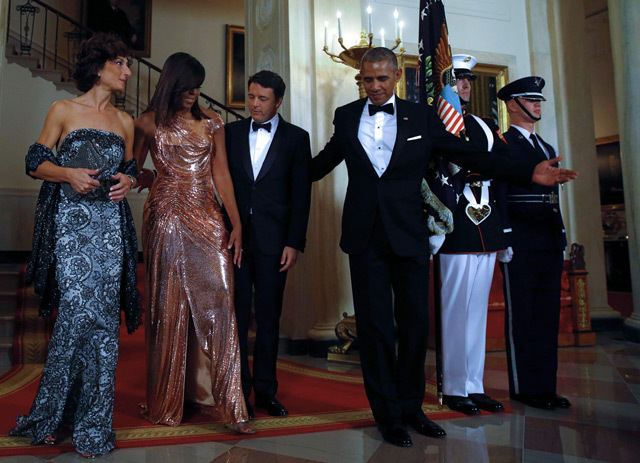 In his pre-dinner toast, Obama said American democracy had been graced by a touch of Italy. He noted that the Lincoln Memorial and the interior of the U.S. Capitol dome were done by Italians, and raised a glass to the “enduring alliance” between the U.S. and Italy. “Michelle, your tomatoes are great. But after the last weeks, let me be very frank, your speeches are better than your tomatoes,” Renzi said, thanking her as the father of a young daughter. The menu was designed to showcase traditional Italian dishes that are familiar to Americans and were made using ingredients pulled from Mrs. Obama’s garden during this month’s final harvest, such as the sweet potatoes and herbs.